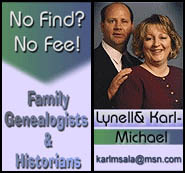 “With the birth of our first child, my wife and I were seeking a genealogist to assist in our German heritage. Karl and his wife, Lynell, have been fantastic. While still a work in progress (which can probably be said about most things in this world) the results so far have been great – they have assisted in going back to the ancestral villages in southern Germany for what is already more than 9 generations of family (he even found a number of lost relatives that we are now in touch with!). His skill with the language and ability to make sense of many of these historical German documents has been key in getting to where he has – a process we know we would never be able to do ourselves. I look forward to continuing to work with him in this endeavor.